This is a dog that strikes fear in the heart of others but remains loyal to his master. 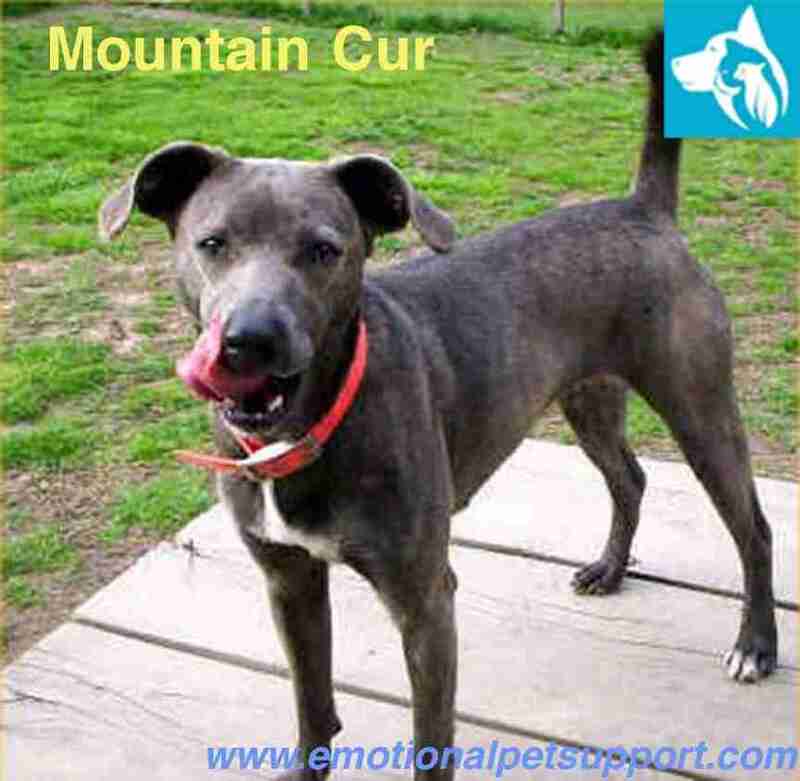 It is the Mountain Cur, a one-of-a-kind dog prided for his courageous heart. Perhaps, you believe this may be the dog for you! But, be warned this is a not breed meant for the faint of heart. However, if you’re a good dog owner, this can be one of the most reliable emotional support animals you can count on. The valiant Mountain Cur is a strong, hardy medium-sized dog breed that can weigh anywhere from 30 to 60 lbs., and tends to have a hound dog appearance so at first glance, it will look alert and full of energy. His head is broad and blocky, his muzzle is neither short nor is it long. His ears are set high and fall down to the level of his eyes, his eyes are dark brown, almond shaped and always sharp. The coat of the Mountain Cur is fairly short, dense and rough to the touch. However, Mountain Curs can also come in a soft-coat variety. The coat color of the Mountain Cur is variable; some of the most common colors seen in this breed include, brindle, blacks, blues, yellows, brown and red. Where his markings can vary from brindle to tan points or white patches around his belly. 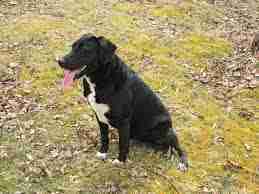 The most distinctive feature of the Mountain Cur is his naturally occurring short-bobtail. This genetic phenomenon allows 50% of Mountain Cur to inherit a short tail while the other 50% may inherit a long tail. The Mountain Cur is overall an intelligent pooch! It’s not going to listen to anyone but his owner. As an easy dog to train, this cur dog will pick up new commands quickly. Mountain Cur puppies are often quite friendly dogs, in fact during 8 to 11 weeks, Mountain Cur puppies should be socialized and trained as often as possible. This is because this is the period at which they will learn and pick up new things quickly. Original Mountain Cur puppies are without a doubt the naughtiest dog you could ever meet (just like their cousins the black mouth cur). At 6 months of age, a Mountain Cur puppy may be no more than 16 inches in height and weigh no more than 24 lbs. They usually are able to triple in size! A typical adult Mountain Cur Dog can weigh up to 60 lbs. and reach a height of 18 to 26 inches. The Mountain Cur is an alpha dog, it’s not the kind of pooch who will submit to any owner; therefore, it needs a firm owner who is not afraid to stand their ground. These dogs will always remain alert and on the watch! This is perhaps what makes him such an excellent guard dog. If you’re looking for a versatile pouch with a heart of gold then look no further! All Cur dogs seemed to have originated from Europe likely during the 1800s. Specifically, the Mountain Cur was a breed developed by the early American pioneers. His breed is believed to have originated from Tennessee, Ohio, Kentucky, and Virginia. These hunting dogs have long served their masters by protecting their family or livestock for over 200 years in America; however, during World War II, their population gradually fell. However, in 1956 the Mountain Cur Breeders’ Association formed, allowing these pups to make a slow comeback. According to the American Kennel Club, the Mountain Cur is classed as a hound (read: hunting dog). However, it shares ancestry with early terrier breeds. His ancestry includes Native curs, Indian curs, and Terrier-like curs. The Mountain Cur has a relatively short coat, so, it’s not going to shed much. Apart from the occasional brush of his coat, the Mountain Cur requires only regular maintenance needs. This includes brushing his teeth a few times a week and cleaning his ears when needed. So, what exactly are Curs? How is the Mountain Cur different? Cur’s are a type of dog breed that were created in the United States. Specifically, according to Dogmal, they originated in Europe but were brought to Ohio, Virginia, Kentucky and Tennessee in the early 1900s. These dogs were bred for the sole purpose of hunting. They are simply hard-working dogs that were developed by crossing various other working dog breeds. Like Black Mouth Curs and the overall cur breed, Mountain Curs love to hunt wild boars, squirrels and more. So, are you ready to commit to a Mountain Cur? This dog breed isn’t cheap! Did you know that a Mountain Cur can be from $300 to $600. But, if you plan on getting your Mountain Cur from a highly reputable breeder you can expect to pay up to $3,500 for a single pup! If you’re considering purchasing a Mountain Cur from a breeder, then do your research to find a reputable breeder in your area. If it’s kept healthy and happy, your Mountain Cur is sure to live for 12 to 16 years. Don’t neglect its training: Because the Mountain Cur is such a strong-willed dog, it knows it can probably get away with whatever it wants. As these dogs are relatively strong they should be trained properly so that they don’t cause a lot of trouble when they’re older. Make it work! The Mountain Cur is a dog built for work, it’s not a lap-dog. If his energy isn’t expended through work then chances are it’s going to get bored. This means that it’s going to cause a havoc at home! Socialize with it! This is very important especially if you know your Mountain Cur is going be around other pets and children. Socialization with children and other pets is crucial if you want your pup to be well-behaved. It’s a big eater! Mountains Curs are fairly big dogs with a lot of energy, so it’s no surprise that it’s going to be a heavy eater. If you’re looking for a dog that will remain loyal to only you, then look no further. Mountain Curs have a unique personality, these are the kind of dogs that will remain tightly bonded to their owner.